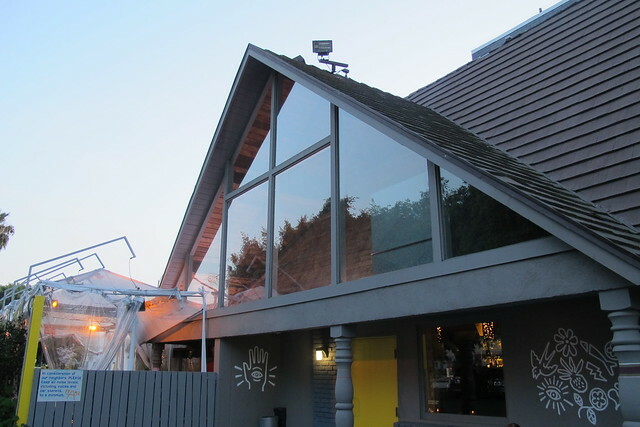 Five years ago, chef Roy Choi of Kogi food truck fame transformed an old IHOP in Culver City into an Asian-influenced “urban picnic” dining spot called A-Frame (after its iconic shape, naturally). 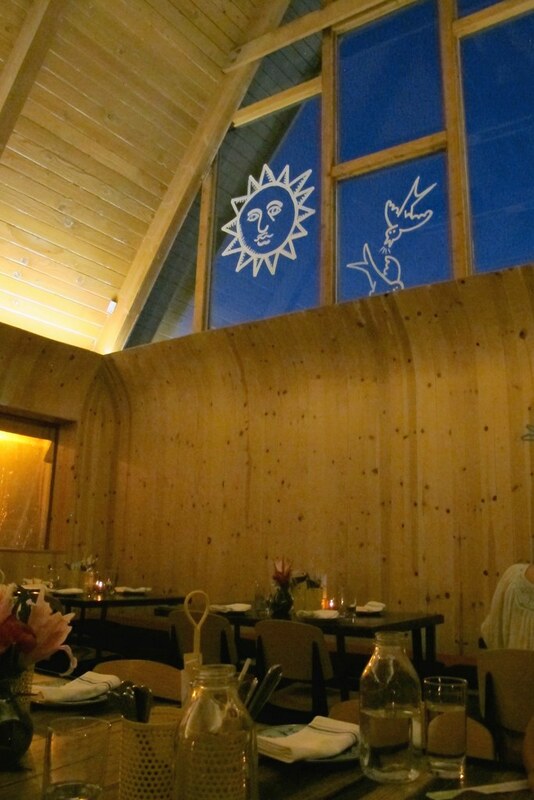 In February 2015, the restaurant fulfilled its architectural destiny by transitioning to a more Hawaiian-centric concept with tiki-esque drinks. 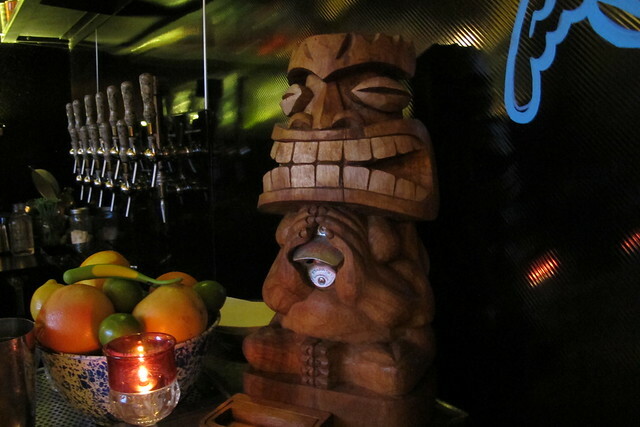 There are some tiki amongst the decor, including a Big Kahuna tiki bottle opener from Smokin’ Tikis perched on the bar. Take a look in the merch display at the reservation stand and you’ll spot a few more tikis. Even if you sampled poi at a luau once and didn’t like it, don’t let that deter you from ordering the Hush Poippies ($9) to start. These crispy bites of taro and potato arrive piping hot to the table because the kitchen sends each dish out as soon as it’s ready. 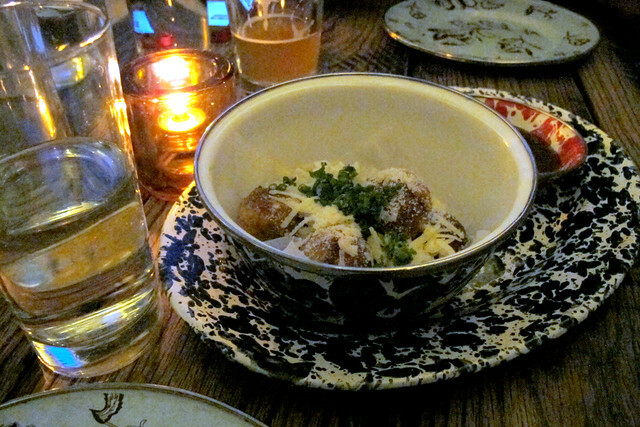 They’re served with a side of sweet chili sauce but are addictive enough on their own with the grated white cheddar and Parmesan. A-Frame produces its own house-made Spam, a noble endeavor that we had to support by getting the musubi (one piece for $5 or a trio for $12). 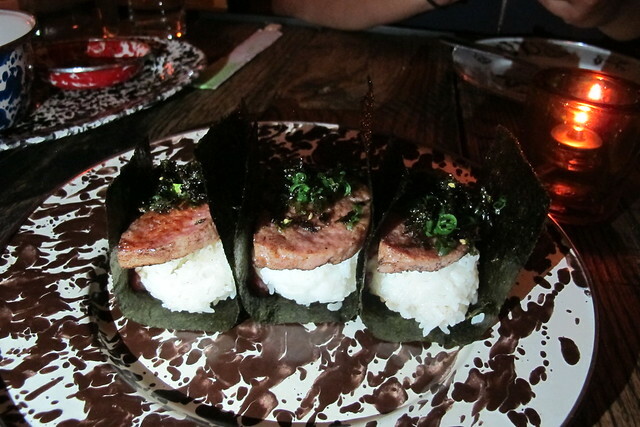 The ume paste brings an interesting, tangy taste to this essential Hawaiian snack made with white rice and Spam wrapped in nori. 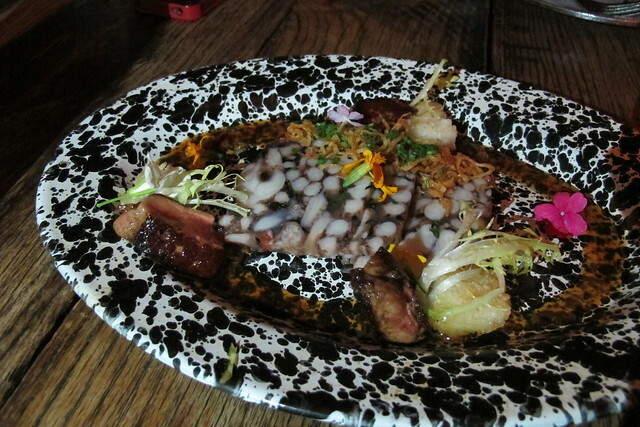 Eight Legged Duck ($17) presents an intriguing pairing of seared foie gras and slices of baby octopus terrine, though we wish the portion had been a bit more generous. In the interest of not running up the bill too high, we’d skip this next time. My meat-and-potatoes man went for the Double Kimcheesburger ($14). 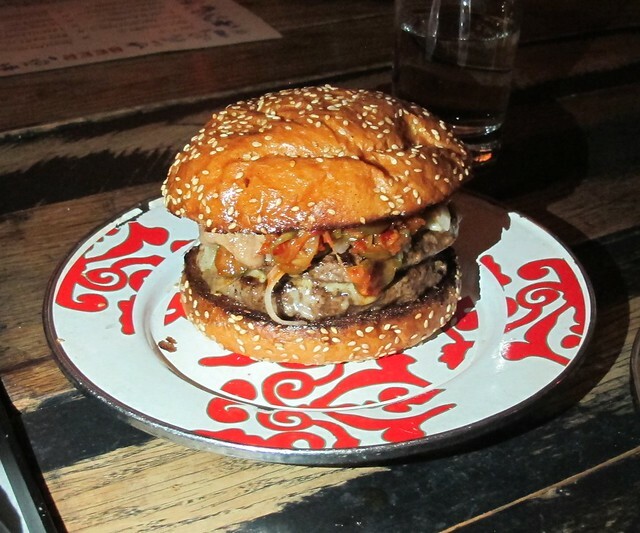 He tends to have more traditional tastes but he was on board with the toppings of cucumber kimchi, bacon guava jam, sweet Maui onion and aged cheddar. 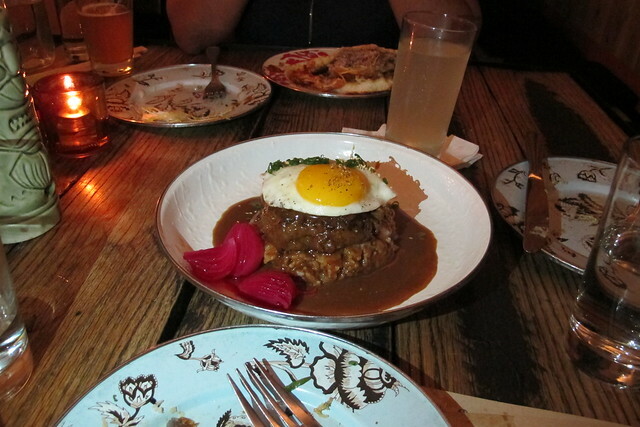 Curry gravy and pickled pearl onions put a slightly different (but very welcome) spin on Loco Moco ($15), that Hawaiian staple of a hamburger patty with rice, gravy and a runny egg. 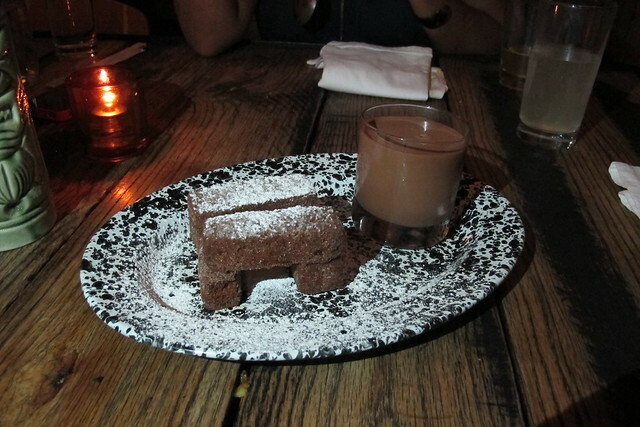 Another carryover from A-Frame’s previous menu is the dessert Chu Don’t Know Mang ($10): pound cake churros with malted chocolate milk and vanilla ice cream. We were blown away by these and can definitely see why it had to stick around. 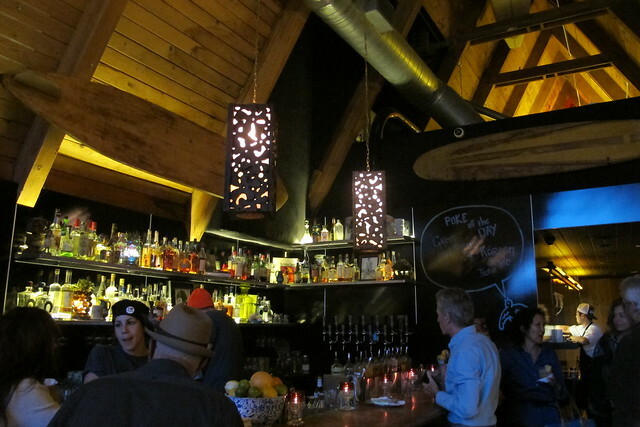 The cocktail list features 11 tiki-inspired tipples, priced at $12 each. The most traditional of the bunch is the Zombie Isle (Bourbon barrel rum, Hawaiian dark rum, lime, orange, apricot, absinthe). (Bonus points for serving it in a tiki mug.) 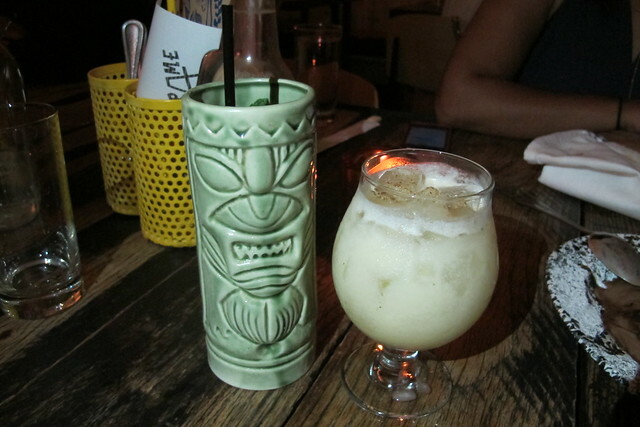 I have to say that I wasn’t a fan of the Pina Cholada (reposado tequila, coconut milk, orgeat, lime, pineapple, egg white). Normally I have no issues with tequila but here it turned me off. I’m still curious to try the other drinks, though — I’m sure there’s a favorite to be found. There’s also 24 oz. cans of Primo available plus several California craft beers on tap. Incredible review. 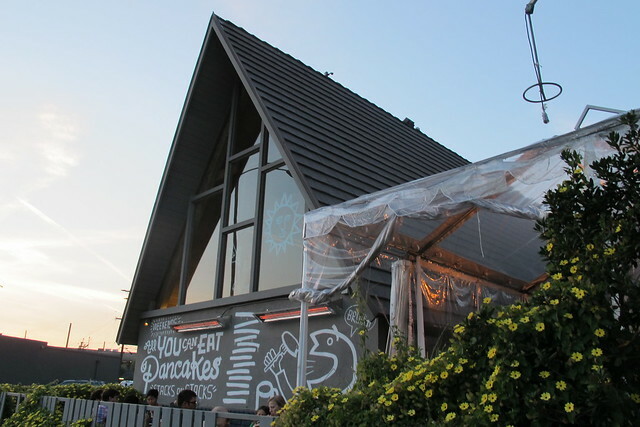 I never knew the history of Roy Choi and Trader Vics. And, I didn’t know of this most welcome Tikification, even though I live in LA! kimcheeseburger! Sounds like delicious perfection. Just the thought of kimchi makes me drool.